There is a wonderful New Scientist article here about the Fine Outreach for Science fellows who are using Gigapan. Our very own Richard Palmer, Ron Schott, Sarah Sharpe and Bill Wallauer have their work with Gigapan in science described. Congratulations! There is a new review of the GigaPan Epic out by Gizmodo. 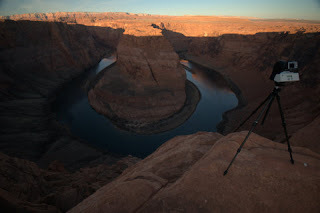 The review is a mixed bag, but shows a wonderful example of a stitched Gigapan panorama with tons of resolution within. The reviewer, Mark Wilson, did make a few mistakes, and it is a pleasure watching GigaPan Nation respond for us all. Thanks Eric Byers for pointing out that in fact it is easy to export to TIFF from the stitcher, and that most of us use batteries with our GigaPans that enable many hundreds of shots with ease (I used rechargeable NiMH myself). Thanks for the community support. The Discovery Channel's "Daily Planet" series just released an episode on TV that you can access on-line that you should take a look at. They filmed this in celebration of Darwin's 200th birthday anniversay, and at about minute 13 it features Alex Smith, one of our Fine Foundation Gigapan fellows, talking about their Barcode of Life project at the University of Guelph. He shows how they use GigaPan to capture the environment of the DNA specimens they collect and this features live usage of the website with a giant touch screen. Enjoy! We have uploaded a documentary produced by Bruno Gex and UNESCO's International Board of Education. The nine minute piece describes joint work between UNESCO-IBE and us at Carnegie Mellon University deploying Gigapan for inter-cultural understanding with learners in Soweto, a township in South Africa and students in Pittsburgh PA. This is a good introduction to our educational Gigapan and Global Connection work. 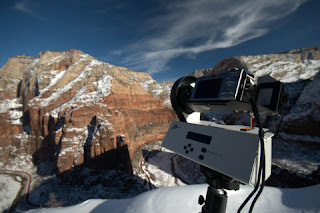 This just in: the last blog entry has images of the GigaPan in Zion National Park. pictures of a GigaPan imager "in the wild." Thank you Chintan for sharing these images. My wife and I did a whirlwind hiking trip of the four corners this Christmas. Before we left I ordered Gigapan while it was in beta. I just wanted to say I had a blast with this robot. It is a lot of fun to use. Here are a few shots of the robots doing its magic at the famous Horseshoe (Page, AZ) and at Angles Landing (Zion National Park, UT). I wish I had taken pictures of Gigapan at all the places I used it. I will have to remember that next time. Gigapan users, we have had a response exceeding our expectations in regards to the 2009 Inauguration Gigapan. We continue to receive tremendous traffic, much of it now originating in other countries where the news is spreading like wildfire. I have hesitated to change the curation of gigapan.org's front page away from the Inauguration panorama because so many are still coming to the site for the very first time. Wonderful Gigapans are being uploaded though, and one of these days I do promise to begin curating the front page with a diversity of images once again. Thank you for your patience and don't forget to use that Most Recent button every day.